The science behind cell therapy. Watch. Ask Questions. – Lab Invaders LIVE. Episode 2: Inside a Cell Therapy lab. DIY is all the rage for Pinterest users and crafty hipsters, among whom ideas for “do it yourself” curtains, jewelry and wedding centerpieces have found a happy home. Not so for PhDs and researchers, at least when it comes to those doing the life-saving work of cell therapy. This burgeoning life sciences field involves modifying a patient’s own cells to fight the world’s deadliest diseases, especially cancer. Despite an increased interest in personalized medicine, with the National Institutes of Health (NIH) announcing major investments in partnerships across the U.S and the approval of the first CRISPR trial in humans, to date cell therapy has nearly been just that: DIY. 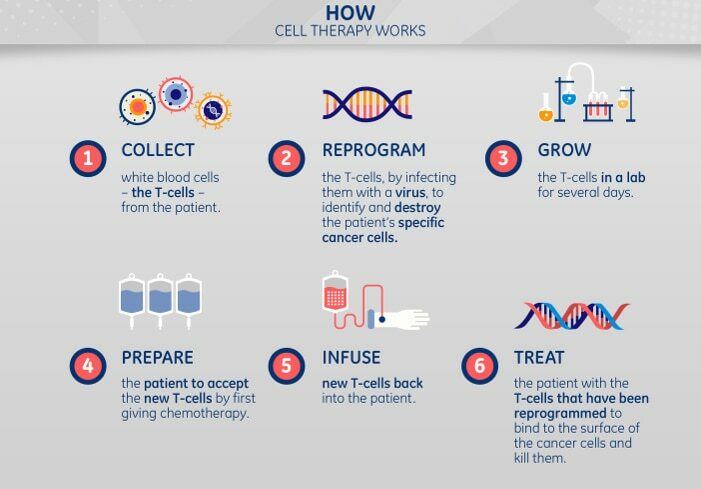 As the term personalized medicine indicates, some cell therapies are completely individualized; in those cases, these cell therapies are handmade specific to each patient (see graphics). But the challenge is that the process required to extract, transfer, grow and replenish T-cells involves hi-tech advanced technology and many materials. Researchers typically have sourced different pieces from different places and then brought them all together in their home lab on their own. As a result, scaling treatment for cell therapy and the many patients who need it has been difficult. Today the industry has taken a massive leap forward for cell therapy researchers – and the 22 million people expected to be diagnosed with cancer in the next two decades (though not all will necessarily be candidates for cell therapy). Last year, GE Healthcare announced it had acquired Biosafe Group SA, a supplier of integrated cell bioprocessing systems for the rapidly growing cell therapy and regenerative medicine industry. Together, GE’s life sciences business and Biosafe’s applications in cord blood banking, cell therapy and orthopedic protocols form one complete ecosystem of tools for cell therapy. Bringing Biosafe and GE together begins to create a start-to-finish solution that cell therapy providers can bring into their labs to optimize every stage of the cell therapy process, bringing these new therapies into mainstream clinical practice, and increasing access to new medicines. 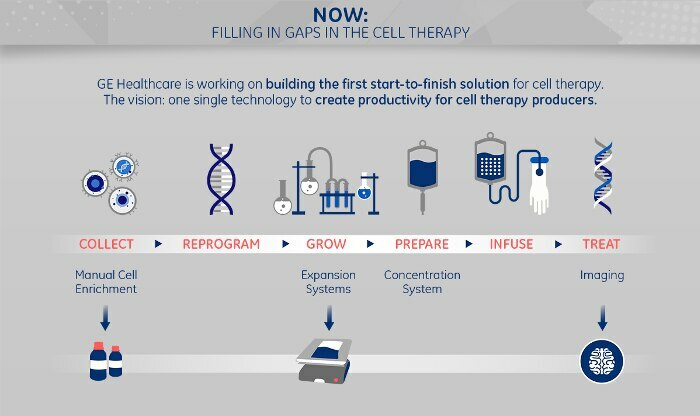 In short, scaling cell therapy from DIY to industrialized. It means researchers can focus on building cell therapies for patients instead of procuring and piecing together equipment to make the process work. It’s the difference between treating just a few patients and, going forward, potentially treating hundreds of thousands of patients. With the cell therapy oncology market alone expected to reach $30 billion by 2030 with more than 600 potentially life-changing therapies in clinical trials at the end of 2015, this could rapidly improve access and revolutionize a field that has long been on the cusp of becoming a reality. “I think for the first time in history we have the opportunity to create real cures for our biggest diseases… not just treat the symptoms,” said May of CCRM, reflecting on the cell therapy industry. This news follows the April launch by GE Ventures and Mayo Clinic of Vitruvian Networks, Inc., an independent platform company committed to accelerating access to cell and gene therapies through advanced, cloud-ready software systems and manufacturing services. In January, GE Healthcare invested CA$20 million in a new cell therapy research and process development hub in Toronto led by Canada’s CCRM, announced by Canadian Prime Minister Justin Trudeau. Many have dreamt , donated and spent decades trying to find the cure for cancer. But if personalized medicine becomes the new way forward, that means there potentially exists a unique treatment for each individual in the world who needs it. With 7.4 billion people in the world, maybe there isn’t the one single cure. Maybe there are 7.4 billion. SEE IT LIVE. The scientists working to scale cell therapy from DIY to industrialized are said to be planning a live broadcast from inside their lab, to sneak viewers into the minds, machines and microscopes making it happen. It’s the second episode of Lab Invaders LIVE.